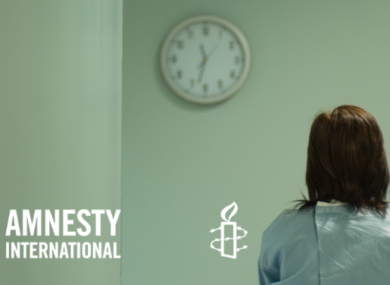 A MAJOR REPORT released by Amnesty International today will draw international attention to Ireland’s abortion laws. The new report, entitled ‘She is Not a Criminal’ will outline key findings on how the regime in Ireland has impacted on individuals going through the healthcare system. Attending the event will be the Secretary General of Amnesty, Salil Shetty. What else will be happening today? The report will be launched at 11am this morning in the Rotunda Hospital and will be followed by events throughout the day. This will be followed later in the afternoon by a private stakeholders meeting from 1pm to 3pm. Later in the day, Executive Director of Amnesty International, Colm O’Gorman, will be sitting in front of the Oireachtas Joint Committee on Health and Children and will be joined by members of Amnesty International’s International Secretariat to discuss the report’s findings. It is hoped that this appearance will instigate political action on the issue at a government level. Included in the report will be a number of case studies of individuals who have personal experience of dealing with Irish abortion legislation. One of its main focuses will be the criminalisation of abortion that is experienced here in Ireland. Currently a possible custodial sentence of 14 years is still applicable to women and the doctors they deal with if they undergo an abortion procedure in the Irish State. Email “International eyes are going to be on Irish abortion laws today ”. Feedback on “International eyes are going to be on Irish abortion laws today ”.